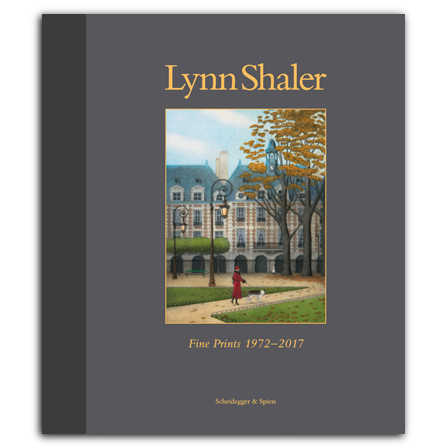 Lynn Shaler: Fine Prints 1972–2017 is the first catalog to spotlight this important American artist’s complete body of work. Many of the etchings have been inspired by locations in Paris, where Shaler has lived for more than thirty years. Although her work has evolved considerably in both subject matter and technique, the etchings all attest to a meticulous printing process and feature explosions of wild, handcolored embellishment with watercolor, gouache, or pastel. The book reproduces a large selection of her works, alongside essays by Diana Stork, Kathy Caraccio, Alfred González, Nancy Mowll Mathews, Gérard Sourd, and Reba White Williams, as well as a conversation with Lynn Shaler. A catalogue raisonné of Shaler’s prints rounds out the book. is a master printer, artist, teacher, and curator. In 1977, she founded K. Caraccio Printing Studio, a studio, workshop, gallery, educational facility dedicated to printmaking in New York City. She has also taught printmaking at various art schools, such as New York University, Columbia University, and Pratt Institute. has been part of the New York art world since 1982, when he began working at Newmark Gallery. In 1994, he founded Gallery 71, where he continues to exhibit and sell the work of Lynn Shaler and a number of other contemporary artists, in an array of different visual media. Alfred is also an accomplished photographer and is one of the Gallery's newest artists. His photographs are in the permanent collections of the 911 Memorial Museum and the Museum of the City of New York. is a scholar of art history, professor, curator, and author. 1988–2010, she was Eugénie Pendergast Senior Curator of 19th and 20th Cenrtuy Art at Williams College in Williamstown, MA. is an American artist known for her color aquatint etchings. She studied printmaking at the University of Michigan and subsequently received a Master of Fine Arts degree from Pratt Institute. In 1984, she won a Fulbright scholarship to pursue postgraduate studies in Paris. Her work has been included in many important museum collections. was a Head Curator at the Bibliothèque Nationale de France, and Editor-in-Chief of Nouvelles de l'estampe from 1990 to 2010. This journal is a scholarly publication issued under the authority of the Prints and Photography Department. Gérard Sourd has served as a juror for many artistic competitions. Currently, he is Honorary Head Curator, Department of Prints and Photography at the Bibliothèque Nationale de France. (Ph.D.), book editor and essayist, is a former college professor and organizational consultant who has transitioned to a portfolio career, taking on a variety of writing projects and consulting activities. This book has been the major focus of her time and energy since 2016. She has collected the etchings of Lynn Shaler for many years, buying her first one in 1992. (Ph.D.) is a well-known expert on fine art prints. She has shared this expertise as an author, philanthropist, and exhibition organizer. Rebaand her husband, Dave Williams, built the world’s largest private collection of fine art prints by American artists. In 2008, they donated more than 5,000 fine art prints to the National Gallery of Art in Washington, D.C.